Lewis Hamilton topped both Friday practice sessions ahead of the Chinese Grand Prix weekend, but Ferrari again showed signs of being able to challenge Mercedes over a race distance. Following Sebastian Vettel’s victory in Malaysia, the big question heading to China was whether Ferrari could sustain its challenge to Mercedes’ F1 hegemony. The times in first practice suggested the pendulum had swung back in favour of the world champions, but in second practice Kimi Raikkonen offered hope of a genuine battle emerging for the second race in a row. Raikkonen’s quick lap was within 0.5s of Hamilton’s best, but it was the long-run pace that looked most impressive as his Ferrari proved quick and consistent on the medium tyres. Hamilton said afterwards that his medium tyres “did not feel too good”, but the significantly quicker soft compound looks likely to be the tyre of choice if degradation of the front left is kept under control. Both Sebastian Vettel and Nico Rosberg failed to impress on their hot laps, with Vettel 0.7s off team-mate Raikkonen and Rosberg running wide at the final corner on his soft tyre attempt. As a result Rosberg was a full second off the pace of Hamilton on a weekend when he needs to reassert himself in the in-team battle at Mercedes. The laps of Vettel and Rosberg allowed Daniel Ricciardo to go third fastest in the Red Bull, although he was still over a second off Hamilton. Ricciardo was running a low-drag rear wing on the RB11, which helped mask the power deficit of the Renault engine but needs to be balanced against the extra strain the reduced downforce will put on the tyres. He was 0.4s quicker than team-mate Daniil Kvyat running the old rear wing, whose session came to an end in the barriers when his brakes failed at Turn 14. Valtteri Bottas was seventh fastest for Williams while team-mate Felipe Massa failed to set a representative time after losing his car under braking for Turn 14. Massa was on his quick lap when the rear of the Williams stepped out under braking and grazed the barrier, knocking off the front wing endplate. The accident left Massa 17th by the end of the session and that allowed Jenson Button to creep into the top 10 with a time two seconds off Hamilton’s best. Fernando Alonso was another 0.5s shy of Button in 12th, but the overall performance was positive for McLaren and Honda as they up the performance of the MP4-30 again this weekend. The session also had a bizarre and unwelcome interruption when a spectator managed to gain access to the pit straight and sprint across the breadth of the track to the pit wall as a Force India exited the final corner. He was quickly apprehended by marshals and passed on to the police, but the intrusion will be a concern for the race organisers. 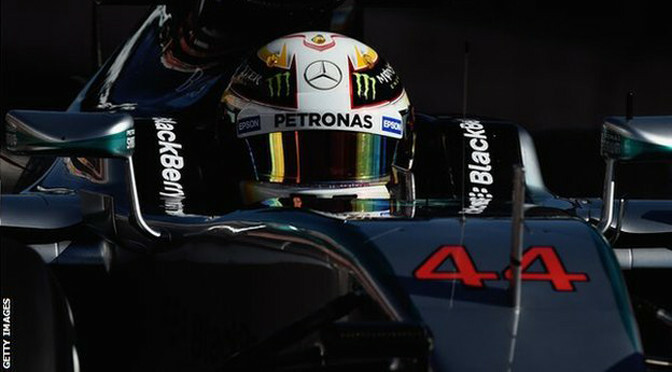 Mercedes driver Lewis Hamilton set the pace on the penultimate day of pre-season Formula 1 testing. The world champion underlined the impression that Mercedes have a clear advantage by beating Williams’s Felipe Massa despite using slower tyres. Hamilton was 0.24secs faster than Massa, who edged Ferrari’s Kimi Raikkonen by 0.014secs, using a tyre which is some 0.5-0.8secs slower a lap. 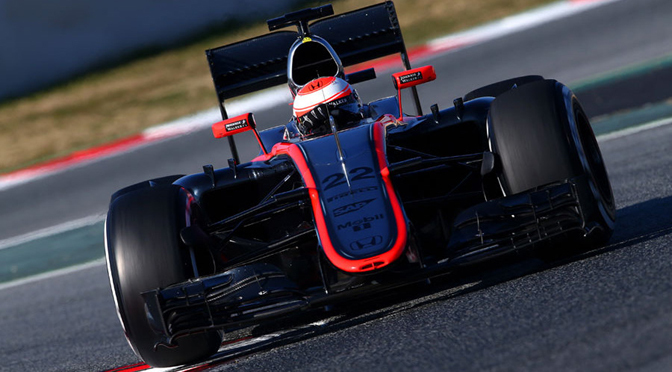 McLaren-Honda again had their running curtailed by a reliability problem. Reserve driver Kevin Magnussen, standing for Fernando Alonso as the Spaniard recovers from concussion sustained in a crash last Sunday, managed only 38 laps before an oil leak in the engine ended the team’s day shortly after lunch. The Dane was eighth fastest, 2.203secs off the pace, after a run on the soft tyre. But despite the setback, Magnussen sounded optimistic about the team’s chances afterwards. Boullier added that “reliability is still a concern” and he said he expected the team to take until the fifth race of the season in Spain in May “to be more competitive”. Red Bull’s Daniel Ricciardo narrowly outpaced Ferrari’s Kimi Raikkonen and Williams’ Felipe Massa on the second day of the second pre-season test. 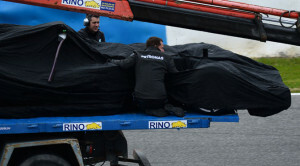 The three were separated by less than 0.1 seconds at the halfway point of Formula 1’s preparations for the new season. Lewis Hamilton and Nico Rosberg of world champions Mercedes finished fifth and sixth fastest. It was a better day for struggling McLaren-Honda, who ran problem-free. Fernando Alonso set the sixth-fastest time despite a cobbled-together fix for an engine problem that had ended team-mate Jenson Button’s efforts on Thursday after just 21 laps. Alonso completed more than 50 laps – by far the team’s biggest single-day mileage of the winter – and set relatively competitive lap times, despite the engine being down on power and carrying a known problem. Honda had warned on Thursday that the temporary fix they had put in place on the energy recovery system could well fail again on Friday. A permanent redesign of the faulty part will be ready for Saturday, when Button is back in the car. He added that the team were going through data-analysis programmes, including checking how the car behaved and reacting to set-up changes, and it was “so far so good”. Ricciardo’s pace-setting time was the fastest of the winter at this track, beating that set by Lotus’s Pastor Maldonado on Thursday by nearly half a second. 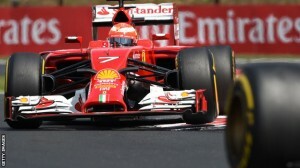 The Australian was 0.01s quicker than Raikkonen, with Massa a further 0.088s adrift. All were running on the ‘soft’ tyre at the time, as was Alonso on his best lap. Hamilton completed a race simulation run in the afternoon at the same time as Ricciardo and set his fastest lap – only 0.349s off the Red Bull – on the medium tyre, which is said to be about 1.2 seconds a lap slower than the soft. Both times were set on similar-length short runs, which suggests the Mercedes continues to have a significant advantage over the rest of the field – as most F1 insiders believed already to be the case. Rosberg’s best time – 0.982s behind Ricciardo – was also set on the medium tyre. The German stopped running at lunch time to rest a neck injury and handed over to Hamilton, who had only partially recovered from a fever that curtailed his running on Thursday. All the teams confirmed as participants in this year’s championship are at the test, where Britain’s Jolyon Palmer was getting his first taste of the new Lotus. The GP2 champion, the team’s reserve driver, was seventh fastest. Pre-season testing times are unreliable indicators of true competitiveness as the teams do not publish the fuel loads they are using, which have a dramatic effect on lap time. Lotus’ Pastor Maldonado topped a scrappy opening day at the second pre-season test in Barcelona, which featured the unusual sight of two cars colliding and saw McLaren and Mercedes hampered by problems. Maldonado leapt to the top of the timing screen with a 1:25.011 less than one hour from the chequered flag, a lap he set on the soft tyre. Maldonado had a frustrating start with two separate stoppages out on track in the morning but the red flag waving was not limited solely to Lotus. There was more woe for McLaren-Honda as a faulty seal on the MGU-K forced the team to change the whole power unit and end its first day early. Jenson Button’s start had been promising as he accumulated 21 laps in the first two hours but it was yet another setback for McLaren and its new engine partner. There was also early difficulty for reigning world champion Lewis Hamilton, who completed just 11 laps before ending his day early due to a fever. A neck injury for Nico Rosberg meant Mercedes had to wait until after lunch for reserve driver Pascal Wehrlein, who completed 32 laps in the morning driving Force India’s 2014 car, to step into the breach. A fuel pump problem after lunch hampered Mercedes further, but Wehrlein managed to add another 48 laps before the close of play. The afternoon session started with an unusual sight for testing as two cars collided. 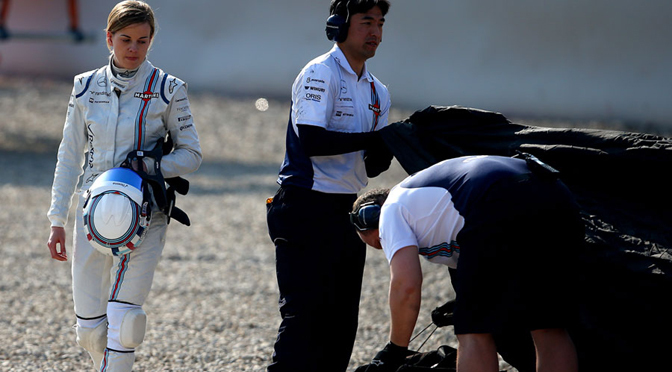 Damage to the left front of Susie Wolff’s Williams and the right rear of Felipe Nasr’s Sauber was the tell-tale sign the two had come together on the run down to Turn 5, with the Sauber beached in the gravel just before the tyre barrier. It is unclear exactly what happened in the crash, though Wolff was on an out-lap when it occurred. 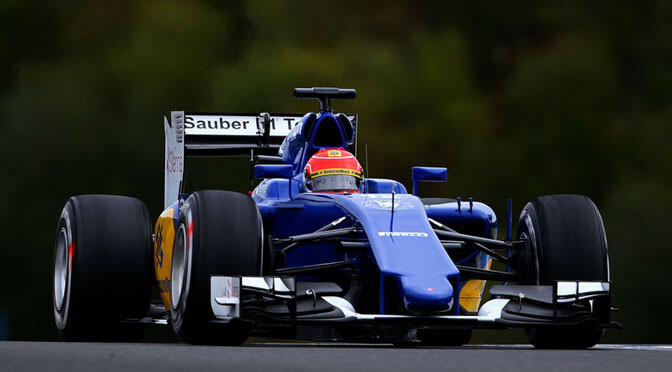 Nasr and Wolff both made it out for late runs but the Sauber finished the session early when it stopped at Turn 9, an incident which brought out a late red flag. Kimi Raikkonen continued Ferrari’s solid start to winter testing, completing 73 laps, though it is still hard to gauge whether the team has made inroads to Mercedes because fuel loads are unknown. However, it will be another morale boosting day of testing after topping three of the four days in Jerez earlier this month. Daniel Ricciardo had been at the foot of the timesheets for much of the morning without recording a time, but the camouflaged Red Bull was one of the more active participants after lunch. The Australian accumulated 58 laps, though rarely in stints longer than five or six at a time. Toro Rosso rookie Max Verstappen also had a disjointed morning and early afternoon but still clocked 93 laps overall with some solid running late in the day. Sergio Perez continued Wehrlein’s good work in the afternoon at Force India and by the end of the session had recorded a 1:26.636 to go 4th, although headline times are still of limited significance. Kimi Raikkonen put Ferrari at the top of the Jerez timesheets for the third day in four as the first week of pre-season testing came to a close on Wednesday. Raikkonen used soft tyres on a dry track to set the fastest time of the test under sunny skies, beating the time set by team-mate Sebastian Vettel on Monday by over a tenth of a second. Ferrari also completed more than a century of laps in a day for the first time this week with a total of the Finn’s 105. There was more slow progress for both McLaren and Red Bull as the two former championship-winning teams struggled again for mileage. From its starting point on Sunday and Monday, McLaren has made progress, but a total of 79 laps over the course of the week is a long way off its pre-test target. Positives came from multiple-lap runs without major issues such as overheating, but smaller reliability problems kept it from running throughout the day. The first run went all of two feet onto the pit apron before the car was rolled back and there was a similar issue as Jenson Button tried to take to the track and stopped in the pit lane on one of his afternoon runs. The team finally called it a day just over an hour before the end of the session when a fuel pump problem could not be fixed. Nevertheless, the team is confident it can be competitive when it is able to turn its power unit up to full power and chase lap times. Red Bull had another slow start to the day as an ERS problem on its Renault power unit forced Daniil Kvyat to park the RB11 on the side of the track. After engine issues on day one, a broken front wing on day two and a full power unit change on day three, the team has only completed 164 laps, which means only McLaren has completed fewer over the course of the four days. Defending champions Mercedes once again topped the lap count with 117 for Lewis Hamilton despite a half spin in the morning at the chicane. The total for the week comes to 517, a remarkable feat for any team on the first week of running with a new car. Although Mercedes is only interested in mileage this week, Hamilton set the third fastest time with a 1:22.172, which was 1.331s off Raikkonen and 0.153s off Marcus Ericsson in the Sauber. Ericsson’s time meant the two Ferrari-powered cars topped all four of this week’s sessions. Elsewhere, Max Verstappen added another 97 laps to his tally for the week in the Toro Rosso and Felipe Massa completed 73 laps for Williams. 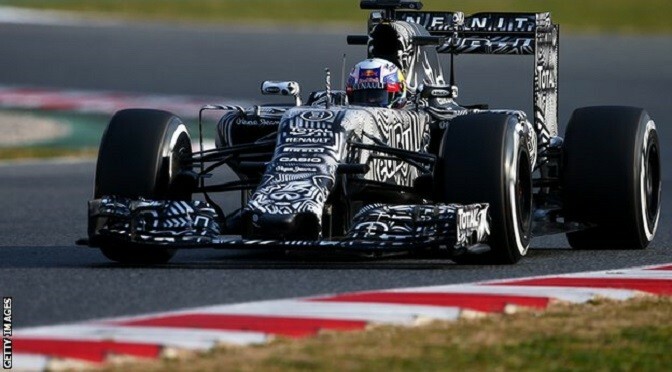 Romain Grosjean took to the track for the first time this year and was impressed with his new Mercedes-powered Lotus. However, a power unit-related problem brought his day to an early end after 53 laps. The third day of pre-season testing in Jerez saw Sauber’s Felipe Nasr at the top of the timesheets, while McLaren made limited progress with its new Honda-powered MP4-30 and Red Bull were delayed by a lengthily Renault engine change. Of more significance to Sauber will be the 108 laps completed by Nasr as his lap time was still 0.5s shy of the benchmark set by Ferrari’s Sebastian Vettel on Monday. However, the quick lap will go some way to boosting his confidence after spinning into the gravel early in the session. The track was damp at the start of the morning but slowly dried under overcast skies to allow slick running for the majority of the day. Nasr’s nearest competitor was Kimi Raikkonen, who got his first taste of the Ferrari SF15-T. After two days of improvement with Vettel at the wheel, the Ferrari lap count increased again to 92 despite a slow start. With the Mercedes W06’s Monday water leak fixed, Nico Rosberg added another 151 to his count on Tuesday to bring his combined total to 308 over two days in the car this week. The day was not quite faultless as the engine shutdown during one of his runs around lunch, but it did not keep the car in the pits for long. For what it’s worth, he set the third fastest time, 0.232s off Nasr’s time. McLaren had a productive morning, with Fernando Alonso matching the lap count of the previous two days in the first two hours, eventually finishing the day on 31. However, a loss of cooling water pressure that required a lengthily investigation of the Honda power unit and ended the day early. Following two unproductive days with engine issues and a broken wing on Monday, Red Bull had another frustrating session when, after five laps, it had to change the Renault power unit in the RB11. The car made it back on track to notch up 48 laps in total, and although it is an improvement on last year, the team will be hoping for plenty of problem-free laps with Daniil Kvyat at the wheel on Wednesday. Felipe Massa got his first taste of F1 2015 with Williams as the team completed another solid day with 71 laps. Carlos Sainz had a very productive day in the Renault-powered Toro Rosso with 136 laps, the second most after Rosberg. 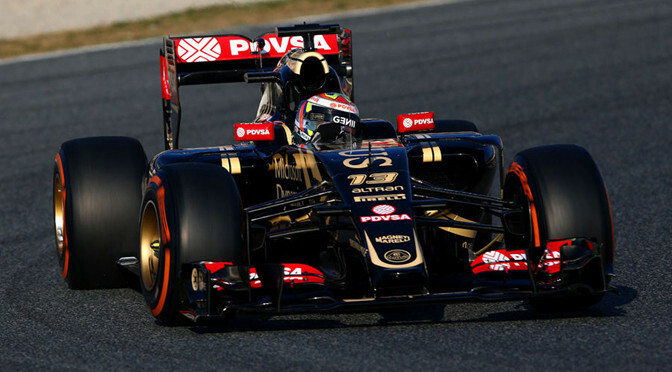 Pastor Maldonado was back in the Lotus and notched up 96 laps before stopping on track on the final run of the day. Kimi Raikkonen told his Ferrari team to address their “weaknesses” after a mistake ended his qualifying session for Sunday’s Hungarian Grand Prix. The Finn, 34, was told he was through to the second qualifying session after posting one of the 16 quickest times. 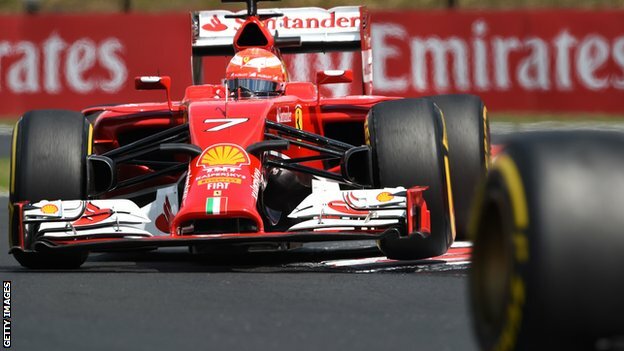 However, Marussia’s Jules Bianchi pushed Raikkonen into 17th, meaning he will start Sunday’s race at the Hungaroring near the back of the grid. “The plan was to go out, but the team said, ‘no, you are fine’,” he said. “I questioned it a few times, but they said, ‘no need’, and we can see the end result. Mercedes’ Nico Rosberg, leader of the drivers’ championship, took pole, while team-mate Lewis Hamilton will start from the back of the grid after his car caught fire during qualifying. 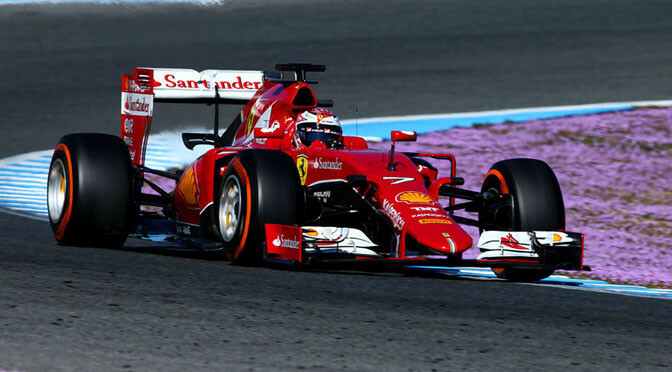 Ferrari’s Fernando Alonso qualified fifth fastest, but Raikkonen was 0.7 seconds slower than the Spaniard in the opening session.